"The footage I took myself using fairly basic cameras that I could fit in my pocket while I was on the job as a deckhand. The story follows me on my six month journey around the world on a container ship which was on a run between New York and Singapore via the Suez Canal. Thanks for watching." IN THE next few days, out of sight of much of the world, the American navy will test the growing naval power of China. 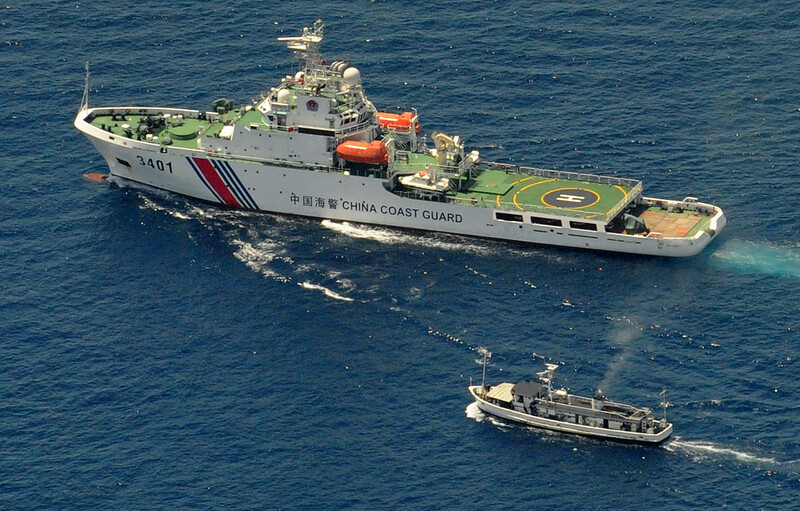 It will do so by conducting patrols within the putative 12-mile territorial zone around artificial islands that China is building in the disputed Spratly archipelago. Not since 2012 has America’s navy asserted its right under international rules to sail so close to features claimed by China. The return to such “freedom of navigation” patrolling comes after a visit to Washington by Xi Jinping, China’s president, that failed to allay concerns about the aggressive island-building in the South China Sea. China will protest, but for now that is probably all it will do. The manoeuvres are a clear assertion of America’s sea power, which remains supreme—but no longer unchallenged. The very notion of “sea power” has a 19th-century ring to it, summoning up Nelson, imperial ambition and gunboat diplomacy. Yet the great exponent of sea power, the American naval strategist Alfred Thayer Mahan, who died in 1914, is still read with attention by political leaders and their military advisers today. Sea power of both the hard, naval kind and the softer kind that involves trade and exploitation of the ocean’s resources is as vital as ever. Bits and bytes move digitally, and people by air. Physical goods, though, still overwhelmingly go by sea: a whopping 90% of global trade by weight and volume. But the sea’s freedom and connectivity are not inevitable. They rely on a rules-based international system to which almost all states subscribe for their own benefit, but which in recent decades only America, in partnership with close allies, has had the means and will to police. Since the second world war, America’s hegemonic power to maintain access to the global maritime commons has been challenged only once, and briefly. In the 1970s the Soviet Union developed an impressive-looking blue-water navy—but at a cost so huge that some historians regard it as among the factors that brought the Soviet system to collapse less than two decades later. When the cold war ended, most of that expensively acquired fleet was left to rust, abandoned in its Arctic bases. On October 7th Russia ostentatiously fired 26 cruise missiles from warships in the Caspian Sea at targets in Syria (it denied American claims that some fell in Iran). Western military planners must now contend with Russia’s demonstrated ability to hit much of Europe with low-flying cruise missiles from its own waters. But by far the more serious naval challenger is China. From modest beginnings it has created a navy that has grown from a purely coastal outfit to a potent force in its “near-seas”, ie, within the first island chain from Japan to the Philippines (see map). It is now evolving again, into something even more ambitious. 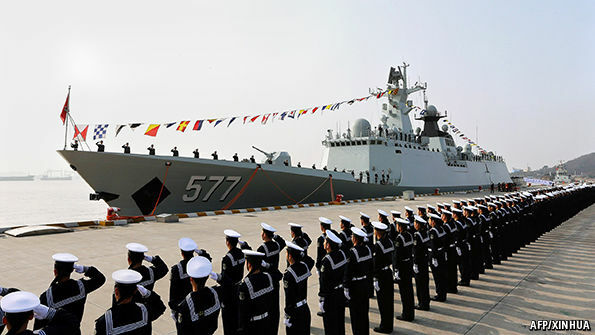 Over the past decade, long-distance operations by the People’s Liberation Army Navy (PLAN) have become more frequent and technically demanding. As well as maintaining a permanent counter-piracy flotilla in the Indian Ocean, China conducts naval exercises far out in the western Pacific. Last month a group of five Chinese naval vessels passed close to the Aleutian Islands after a Russian-Chinese military exercise. 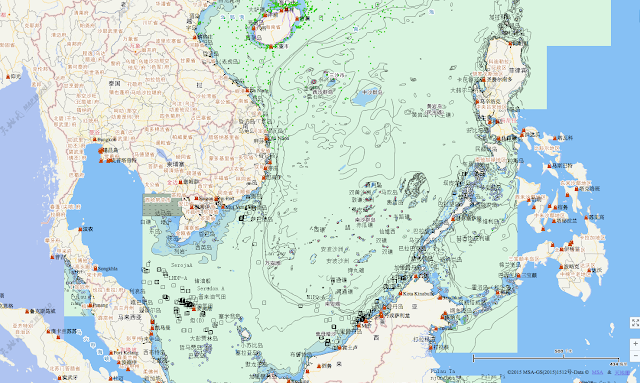 In May China issued a military white paper that formalised the addition of what it calls “open-seas protection” to the PLAN’s “offshore-waters defence” role. A strategy that used to put local sea control first now emphasises China’s expanding economic and diplomatic influence. The primacy China once gave its land forces has ended. The traditional mentality that land outweighs the sea must be abandoned, and great importance has to be attached to managing the seas and oceans and protecting maritime rights and interests. It is necessary for China to develop a modern maritime force structure commensurate with its national security. Taiwan remains at the centre of these military concerns. China seeks to develop not only the means to recover the renegade province (as it sees it), by military means if necessary, but also to fend off Taiwan’s main protector, America. China has not forgotten its humiliation in 1996 when America sent two carrier battle groups, one through the Taiwan Strait, to deter Chinese missile tests aimed at intimidating the Taiwanese government. China is determined to change the balance. China is also seeking the ability to patrol the choke points that give access to the Indian Ocean, through which most of its oil imports enter. About 40% comes through the Strait of Hormuz and over 80% through the Malacca Strait. Among the goals it appears to have set itself are to protect economically vital sea lanes; to constitute a dominating presence in the South and East China Seas; and to be able to intervene wherever its expanding presence abroad, whether in terms of investment or of people, may be threatened. In August the Pentagon announced a new Asia-Pacific Maritime Security Strategy. It stresses three objectives: to “safeguard the freedom of the seas; deter conflict and coercion; and promote adherence to international law and standards”. It confirmed that America was on schedule to “rebalance” its resources by deploying at least 60% of its naval and air forces to the Asia-Pacific by 2020, a target announced in 2012. Ray Mabus, the navy secretary, has asked Congress for an 8% increase in his budget, to $161 billion for the next fiscal year; he wants the navy to grow from 273 ships to at least 300. Some Republicans say that 350 is the right number. Is America right to be worried? The way China is going about becoming a global maritime power differs somewhat from the Soviet Union’s great period of naval expansion. Apart from the powerful Soviet submarine fleet, the main purpose of which was strategic nuclear strike and stopping American reinforcements crossing the Atlantic to come to Europe’s aid, the Soviet navy was mostly concerned with expressing great-power status and extending Soviet influence around the world through “presence” missions that impressed allies and deterred enemies. In this Sept. 17, 2015 file photo, Adm. Harry B. Harris, Jr. of U.S. Navy Commander, U.S. Pacific Command walks past a photograph showing an island that China is building on the Fiery Cross Reef in the South China Sea, as the prepares to testify on Capitol Hill in Washington. These matter to China, too: a central element of what Mr Xi calls the “China dream” is its transformation into a military power that can cut a dash on the world stage. When large naval vessels exercise or enter port far from home they can be used to influence and coerce. It is understandable that a country of China’s size, history and economic clout should want some of that. Nor is it strange that China should want to prevent a possible adversary (ie, America) from operating with impunity near its own shores. What makes China’s rise as a sea power troubling for the countries that rely on America to maintain the rules-based international order and the freedom of the seas are its behaviour and where it lies. The Indian Ocean, South China Sea and East China Sea are vital transit routes for the world economy. Eight out of ten of the world’s busiest container ports are in the region. Two-thirds of the world’s oil shipments travel across the Indian Ocean on their way to the Pacific, with 15m barrels passing through the Malacca Strait daily. Almost 30% of maritime trade goes across the South China Sea, $1.2 trillion of which is bound for America. That sea accounts for over 10% of world fisheries production and is thought to have oil and natural-gas deposits beneath its floor. Much of this is contested, with China the biggest and most aggressive of the claimants. In the South China Sea Beijing’s territorial disputes include the Paracel Islands (with Taiwan and Vietnam); the Spratlys (with Taiwan, Vietnam, the Philippines, Malaysia and Brunei) and Scarborough Shoal (with the Philippines and Taiwan). 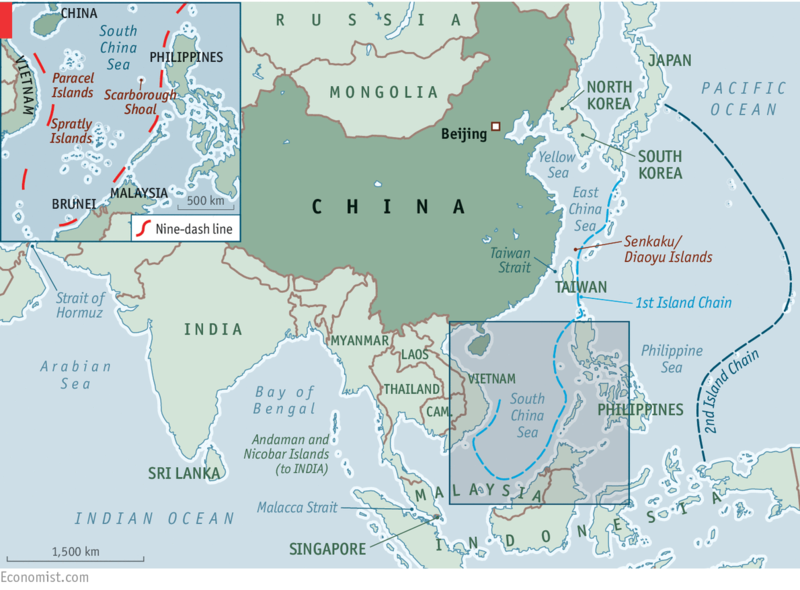 China vaguely claims sovereignty within its so-called nine-dash line over more than 90% of the South China Sea (see map). The claim was inherited from the Kuomintang government that fled to Taiwan in 1949; whether this applies only to the islands and reefs, or to all the waters within it, has never been properly explained. In the East China Sea a dispute with Japan over the Senkaku Islands (which Japan controls) rumbles on, though the mutual circling of coastguard vessels has become more ritualised of late. America takes no position on these disputes, insisting only that they should be resolved through international arbitration rather than force, and that all sovereignty claims should be based on natural land features. Yet China is using its growing sea power coercively, carrying out invasive patrols, encroaching on other claimants’ waters and, most recently, creating five artificial islands in vast land-reclamation projects on previously submerged features (which, under the UN Convention on the Law of the Sea, do not grant entitlement to the 12-mile territorial waters). These are being equipped as advanced listening posts and three are getting runways and hangars, meaning they can rapidly be put to military use. China is not the first to build in the area. But in less than two years it has reclaimed nearly 20 times as much artificial land as rival claimants together have in the past 40. Its bases would be easy for America to neutralise; but, short of war, they allow China to project military power much farther than hitherto. No wonder America’s national security adviser, Susan Rice, recently vowed that American forces will “sail, fly and operate anywhere that international law permits”, and that those “freedom of navigation” patrols would resume. The Pentagon document notes that the PLAN now has the largest number of vessels in Asia, with more than 300 warships, submarines, amphibious ships and patrol craft. Indonesia, Japan, Malaysia, the Philippines and Vietnam can muster only about 200 between them, many of those older and less powerful than China’s (see table). This preponderance is hardly less daunting when it comes to maritime law-enforcement vessels: it has 205 compared with 147 operated by those five countries, which it often uses to stake its territorial claims while more lethal naval forces lurk over the horizon. Although nearly all the countries in dispute with China are trying to buy or build new ships, the capability gap continues to widen. China could therefore threaten, if so minded, the rules and norms governing maritime boundaries and resources, freedom of navigation and the peaceful resolution of disputes. Would America be ready to face that challenge? Those who fear that America’s ultimate retreat is inevitable are almost certainly wrong. 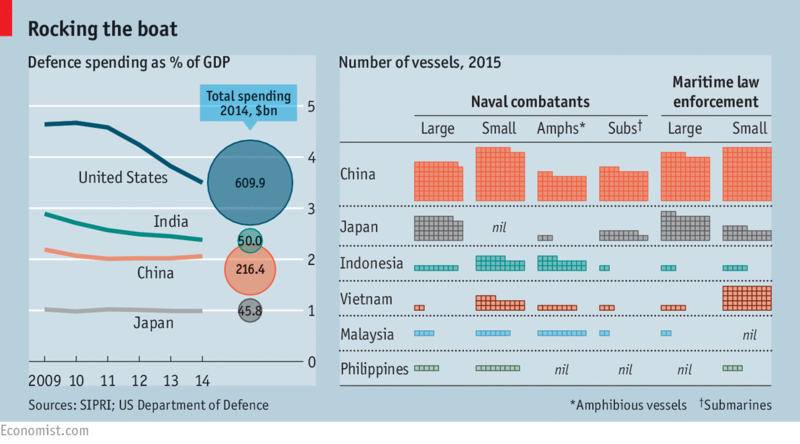 Although growing fast, China’s entire (official) defence budget is not much more than that of America’s navy alone. America has ten nuclear-powered supercarriers, one of which is permanently based in Japan. China has just one, a small, refurbished Soviet-era affair, and two more under construction. 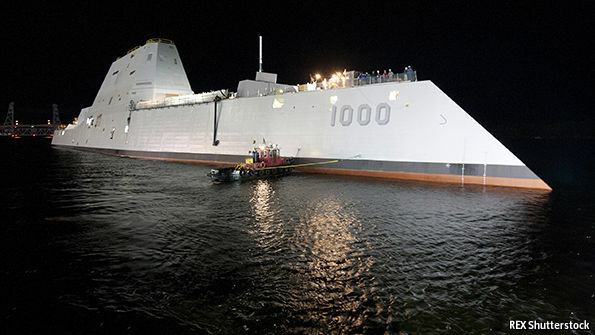 All three of America’s latest Zumwalt-class stealth destroyers (pictured), the world’s most advanced surface warships, will be deployed in the Asia-Pacific region along with other new ships and aircraft. Chinese military experts believe that the PLAN will take another 30 years to match the efficiency of the American navy. America also has the advantage of having other navies to work with and alongside, both in the region and globally. Japan’s Maritime Self-Defence Force lacks power-projection, but is regarded as the fifth-best navy in the world and is used to exercising with the American navy. The relaxation of national-security laws last month, allowing the Japanese navy to co-operate much more closely with allies on a greater range of missions, went down badly in Beijing. And Japan is working hard with regional neighbours who are in territorial disputes with China. It has made soft loans to the Philippines and Vietnam for new patrol vessels and older destroyers. The Indian navy is another powerful ally. As concern about China has grown, it has started to drill with Western navies, who rate its competence highly. The annual Malabar exercise with the American navy now also includes ships from Australia, Singapore and, this year for the first time, Japan. The newish government of Narendra Modi is aiming for a 200-ship navy by 2027, with three carrier task groups and nuclear-powered submarines. Catching up with the PLAN is impossible, but the Indian navy is determined to stop the Indian Ocean becoming a “Chinese lake”. Indian strategists have long believed that China is establishing a network of civilian port facilities and underwriting littoral infrastructure projects to boost its vessels’ ability to operate in waters which the Indian government thinks should be under its dominion. China now often sends its nuclear-powered submarines into the Indian Ocean. China has benefited as much as any other country from the hegemonic power of the American navy to preserve peace in the Asia-Pacific region. This has helped its remarkable growth. Yet it seems determined to challenge that order. 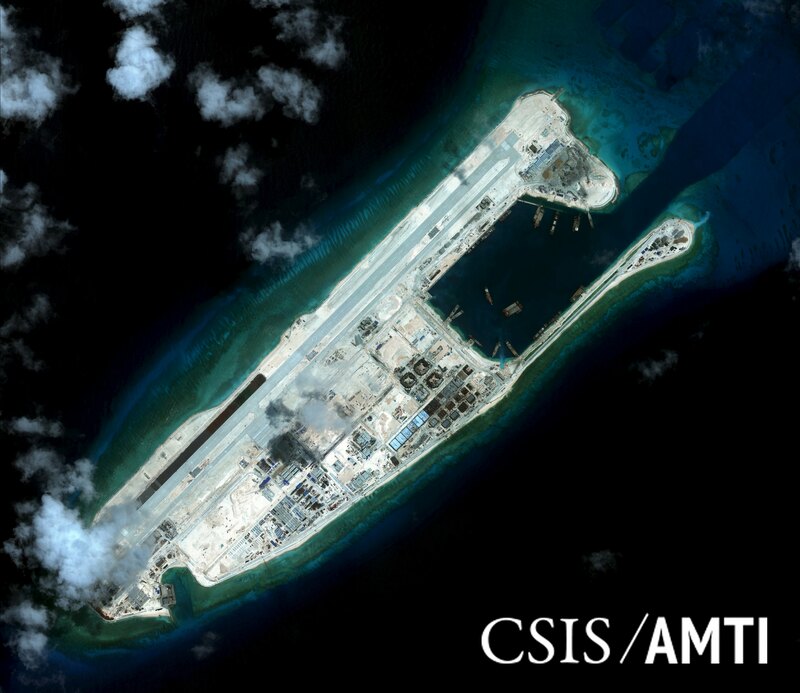 It is understandable that China should want to make it riskier for the American navy to operate close to its own littoral. And for a country that wants a “new type of great power relationship”, relying on America to police the seas is demeaning, though the notion that America and its allies are threatening to blockade the sea lanes of communication that are the arteries of China’s, and the world’s, trade is fanciful in any scenario short of war. But should it ever come to war over, say, a Chinese invasion of Taiwan, China will want to deny America the ability to come to Taiwan’s aid, or at least delay it. The flip-side is that by developing a navy which intimidates its neighbours, China is driving them ever more closely into America’s embrace. Moreover, being a strong but still second-best sea power can result in disastrous miscalculation. Germany challenged British naval supremacy early in the 20th century by provoking ruinously expensive competition in battleship construction. But it was still powerless to break Britain’s blockade during the first world war. As for Japan, six months after its surprise attack on Pearl Harbour during the second world war, it lost the decisive battle of Midway and with it a large part of the fleet it had built with such hubris. There is nothing wrong with China regarding a powerful blue-water navy as essential to its prestige and self-image, particularly if it eventually concludes that it should be used to reinforce international rules rather than undermine them. The worry is that China itself may not know what it will do, and that the temptation to use it for more than flag-waving, diplomatic signalling and discreet bullying will become hard to resist. It does not have to be like that, but America must prepare for the worst. The Guardian : Chinese media: military must be ready to counter US in South China Sea / What’s behind Beijing’s drive to control the South China Sea? By the end of this year 38% of the world’s reefs will have been affected. About 5% will have died. In the Pacific, a tiny island 300 miles away from the shore hides a giant mountain beneath the waves that forms a home for thousands of planton feeding fish. These fish attract tuna, and the tuna attract thousands of sharks. The world’s oceans absorb about a third of all the carbon dioxide emitted by the burning of fossil fuels. The ocean has warmed by about 1C since pre-industrial times, and the water increased to be 30% more acidic. The acidification of the ocean, where the pH of water drops as it absorbs carbon dioxide, will make it hard for creatures such as coral, oysters and mussels to form the shells and structures that sustain them. Meanwhile, warming waters are changing the behaviour and habitat range of fish. The overarching analysis of these changes, led by the University of Adelaide, found that the amount of plankton will increase with warming water but this abundance of food will not translate to improved results higher up the food chain. As there is less prey available, that means fewer opportunities for carnivores. There’s a cascading effect up the food chain. Waters are warming in the Caribbean, threatening coral in Puerto Rico and the U.S. Virgin Islands, NOAA scientists said. Coral bleaching began in the Florida Keys and South Florida in August, but now scientists expect bleaching conditions there to diminish. This bleaching event, which began in the north Pacific in summer 2014 and expanded to the south Pacific and Indian oceans in 2015, is hitting U.S. coral reefs disproportionately hard. The biggest risk right now is to the Hawaiian Islands, where bleaching is intensifying and is expected to continue for at least another month. Areas at risk in the Caribbean in coming weeks include Haiti, the Dominican Republic and Puerto Rico, and from the U.S. Virgin Islands south into the Leeward and Windward islands. The next concern is the further impact of the strong El Niño, which climate models indicates will cause bleaching in the Indian and southeastern Pacific Oceans after the new year. This may cause bleaching to spread globally again in 2016. The research adds to recent warnings over the state of the oceans, with the world experiencing the third global bleaching of coral reefs. Since 2014, a massive underwater heatwave, driven by climate change, has caused corals to lose their brilliance and die in every ocean. Coral reefs are suffering a severe underwater heatwave this year - resulting in the third global bleaching event seen in oceans around the world. Coral reefs make up just 0.1% of the ocean’s floor but nurture 25% of the world’s marine species. There are concerns that ecosystems such as Australia’s Great Barrier Reef, which has lost half its coral cover over the past 30 years, could be massively diminished by 2050 unless greenhouse gas emissions are slashed and localized pollution is curbed. Meanwhile, warming of the oceans is causing water to thermally expand, fueling sea level rises caused by melting land ice. Research released in the US on Monday found that Antarctic ice is melting so fast that the whole continent could be at risk by 2100, with severe consequences for coastal communities. Problems in the ocean’s food chains will be a direct concern for hundreds of millions of people who rely upon seafood for sustenance, medicines and income. The loss of coral reefs could also worsen coastal erosion due to their role in protecting shorelines from storms and cyclones. “These effects are happening now and will only be exacerbated in the next 50 to 100 years,” Nagelkerken said. Not funny, but kind of true. Rising tides are already lapping away at shorelines from Bellingham to Biscayne Bay. And with atmospheric carbon dioxide levels steadily rising, many of the country’s coastal cities and towns will someday be under water. That’s even if the December Paris climate talks lead to significant global emissions cuts. A new map from Climate Central shows how the water will flow into hundreds of US cities under the best and worst global warming scenarios. It uses data from an accompanying study, published today in the Proceedings of the National Academy of Sciences, that links CO2 to sea level rise to the topographic contours of the coastal US. A lot of this inundation is already on the books. Called locked in rise, it comes from energy banked in atmospheric CO2. Carbon molecules will eventually release that energy as heat, which will raise the global mean temperature. Seasons will cycle, years will pass, and weather patterns will fluctuate. And after some time—could be decades, could be centuries—the atmosphere will settle its thermodynamic debt, and a bunch of ice will melt. It’s not just the volume of added ice that makes the oceans rise. The Antarctic and Greenland ice sheets are so massive that they exert gravitational pull on the ocean. (Disclosure: I was a Climate Central data visualization intern for a few months in 2013). Warmer water is also less dense. Higher and higher those waters will climb. But how far depends on how much carbon humans continue to emit. “For a long time I’ve wanted to be able to show a map that very clearly contrasts the future under high carbon emissions or low carbon emissions,” says Strauss. Developed in partnership with COMET Program/MetEd, "Geospatial Infrastructure for Coastal Communities" is aimed at community planners, emergency managers, and other coastal zone decision-makers. This video will explain how using geospatial information already available through NOAA, combined with strategic local investments in infrastructure can provide communities with the data needed to confidently plan for future sea-level changes. The research began by linking a historical data set showing how temperature affects peak sea level rise with another data set showing the relationship between carbon emissions and temperature. After millions of computer experiments, they had some usable ratios of between carbon emissions to sea level rise. “One of the most astonishing things to me was finding that burning one gallon of gasoline translates to adding 400 gallons of water volume to the ocean in the long run,” he says. Coastal topography maps accurate down to a few inches showed where the water would rise. “Local, state, and federal agencies have been flying lidar missions over coastal areas for 15 years now,” says Strauss. Finally they added the 2010 census, and used the historic high tide lines to measure which pixels (each representing about 15 feet per side on the ground) would be drowned in the inundated future. Or at least, some version of the future. They projected their data using four future emissions scenarios, ranging from extreme carbon cuts to emissions-heavy business as usual. “They’ve effectively tied human behavior to different outcomes, quantified by the inundation of various coastal population centers,” says Steve Nerem, a sea level rise expert at the University of Colorado. For example, when the global atmospheric CO2 level reaches 930 gigatons, Boston will be due for about 9 feet of sea level rise. That’s enough water to cover 25 percent of the city during high tide. In the extreme cuts scenario, atmospheric CO2 never reaches that level. 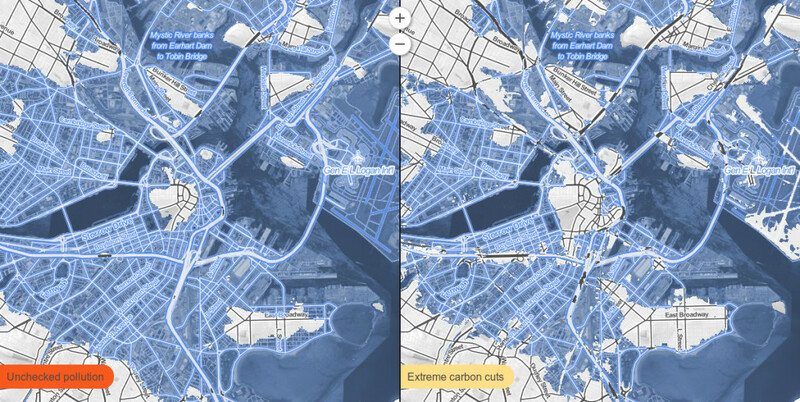 Under business as usual fossil emissions however, a quarter of Boston is locked into a future under water by 2045. Existential nihilists however, can relax: Nobody’s doomed yet. Future Americans are going to deal with the flooded basements and foregone civilization. “Those generations could know lower Manhattan as a place to visit, or as a place to go diving for ruins,” says Strauss. with the combined effects of storm surge and sea level rise. The study, in other words, isn’t about how much see level rise happens this century, but whether this century’s emissions bank enough carbon for total ice melt down—or some less drastic version. “Our analysis really looks at a 2000 year envelope,” says Strauss. “It turns out it’s a lot easier to project how much the sea level will rise than how quickly the sea level will rise,” says Strauss. Blame geology for the uncertainty. “We do not know much about the bedrock on which the ice lies,” says Anders Levermann, study co-author and climate scientist at the Potsdam Institute for Climate Impact Research in Germany. Under the ice, Greenland and Antarctica are uncharted territories. In order to calculate the rate at which those massive ice sheets slough off, Levermann says he would need to know more about the texture of the underlying rock. The Filchner-Ronne ice shelf is the second largest ice shelf in Antarctica. Linking CO2 to sea level rise isn’t exactly novel, but it’s not often you get to look at how the emissions decisions our species make today will affect the seaside legacy left for future generations. If you’ll pardon the pun, this map really brings climate change home. Planet OS is a cloud-based big data architecture for search, analysis & discovery for real-world sensor networks in the oceans and atmosphere, on land and in space. Planet OS’s goal is to index the public web for geospatial sensor datasets and become the first place every data professional or executive will use to look for sensor data intelligence; facilitate data exchange between parties, and allow developers to build domain-specific big data applications for enterprise workflows. 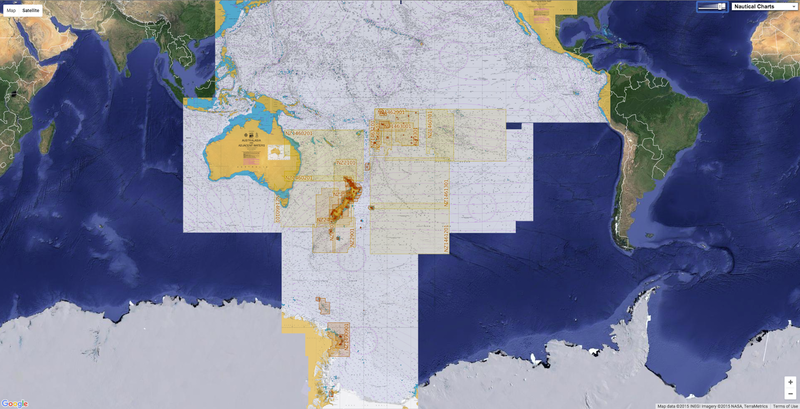 Planet OS biggest deployment is Marinexplore.org, the biggest free service on the web for public ocean data with over 33 organizations, 7,500+ users and 40,000 data streams updated daily. It’s a powerful tool that helps us battle climate change or keep companies sustainable. But there’s so much data, and it’s hard to corral, index, and understand. However, one company wants to give Earth a “planetary nervous system” to help out companies and policy makers make faster, more informed decisions that’ll be beneficial for the blue marble we call home. It’s a cloud-based service called Planet OS, and its goal is to index the world. See, humans gather a lot of great data, with sensors like buoys, satellites, drones, robots, or research ships. This data includes everything from seismic activity to weather patterns. A lot of times, this information is delivered to engineers and scientists via external hard drives, FTP, or email, and can be duplicated and hard to gather and parse. But this Bay Area-based company gives execs and data scientists an interface that visualizes and analyzes all relevant, real-time, baseline environmental data (both commercial and public) in one place. It’s great, when compared to the alternatives: Creating a custom, in-house software for companies to gather data themselves, or buy a database that goes out-of-date quickly once new generations of sensors are produced. The company’s users include names like Chevon, BP, and Premier Oil. They help them corral data, find broken sensors in real time, and more, providing environmental data 80% faster. The company is one of 14 innovators the United Nations picked to help address the 17 Sustainable Development Goals by 2030. Planet OS presented to 250 senior policy makers and tech execs from around the world at United Nations Headquarters in New York last month. Planet OS is California-based but was founded by a team of Estonian engineers. The goal is to help encourage the planet’s big wigs make better decisions in agriculture, energy production, or manufacturing, since they’ll have easier access to easier-to-understand data. Data’s powerful, but only if you know what to do with it. A thing airplanes and modern boats have in common is the autopilot feature. That might sound pretty high-tech, but the harsh reality of the autopilot is that it is a responsive system after all. This means that it needs to detect a change in the environment in order to adjust the parameters of the vehicle. Three undergrads from the University at Buffalo, New York, prepared an upgrade for the antiquated marine autopilots. To reach their goal, the engineering students created the Buffalo Automation Group. The incorporation allows them to secure intellectual property as well as receive funding for the ongoing development process. Their efforts are promising, to the extent that we might see autopilot self-navigating boats very soon. The young researchers point out the big difference between the current autopilot systems which are reactive, and their patent, which is advanced enough to be predictive. Their marine autopilot system uses a multitude of cameras, sensors and Wi-Fi communication to map, evaluate and bypass hostile weather conditions, obstacles in the water or any potentially dangerous situations. 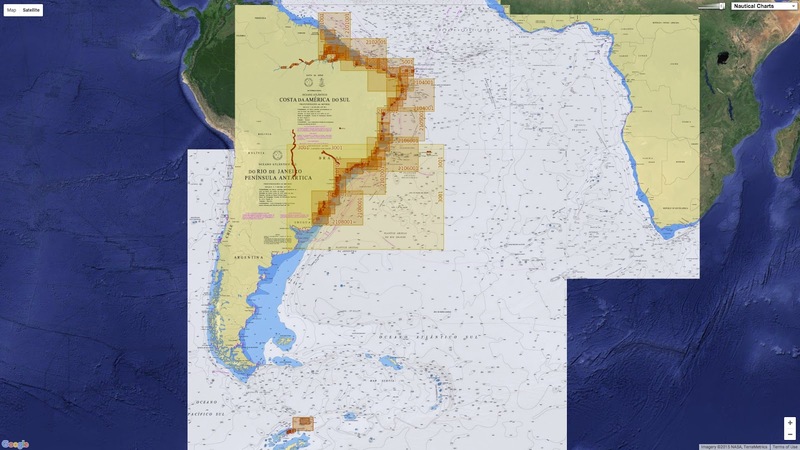 Static nautical data helps the computer steer the ship along the safest, simplest course. 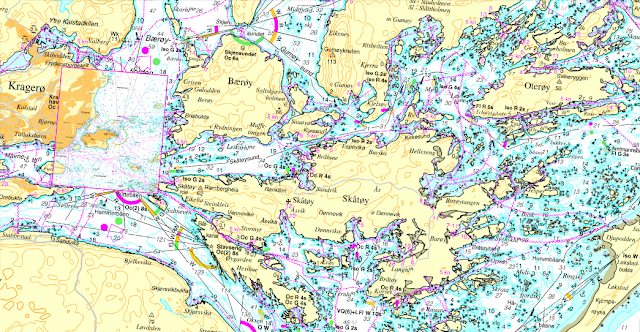 Nautical charts are an important part of the system's database. Skippers may simply select a destination from their connected laptops or smartphones. "Essentially, you will connect your smartphone or laptop to the system. From there, you use your device to tell the system where you'd like to go. It then guides the boat, from port to port, using the safest, most efficient route possible," explains Alex Zhitelzeyf, one of the group's co-founders. Multiple destinations are supported, so passionate sailors can plan a whole itinerary. The software is advanced enough to even dock the ship upon reaching port. 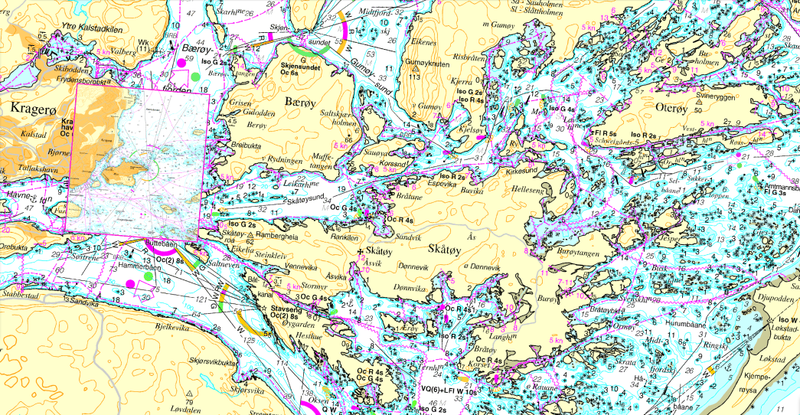 The captain can take manual control of the boat anytime or rely entirely on the navigation software. Buffalo Automation targets small yachts and motorized boats up to 40 feet long, based on the flawless tests that it did on a 16-foot catamaran. The three students expect to further improve the predictive autopilot system after finishing their undergraduate degree. They already stated that they are interested in attracting capital venture to take the idea into serial production. Boat manufacturers and marine electronics producers might want to take a closer look at the team's device.